As explained in the first page of hand gestures, a single sign can definitely have several meanings depending on how it is displayed. 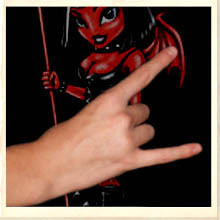 To the right are four images of the “Horns” sign that demonstrate this statement. All have quite unique meanings based on how the hand is held. Two further variations not included in the images are the “surfers greeting” and the “telephone” gesture. These are depicted later. Depending on the culture, this gesture is designed to curse or to ward-off a curse. Used as shown in the picture, it is inflicting an evil influence. However, if the arm is lowered and the fingers were pointed downwards it is more likely to mean that a curse has been deflected. To inflict a curse the hand is jabbed forward and aimed at the heart of the intended recipient. 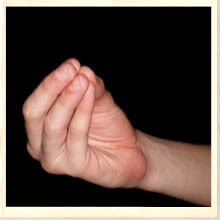 Very Italian in its use, its exact origins are unknown but it is a common and highly superstitious hand gesture in Naples where it should never be confused with the “You’ve been cuckolded” sign. 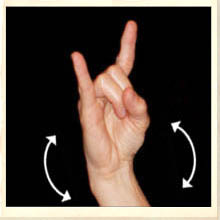 This gesture, usually made across the stomach or chest was popularised by “rock’ legend Ronnie James Dio. It’s use as an alternative culture “Safe” or “all’s cool” hand gesture predates this in at least one country. 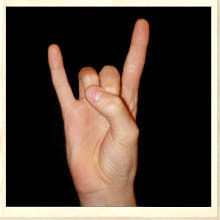 This sign was common amongst South African teens prior to the fall of apartheid (1960’s / 80’s) and was generally accompanied by the expression “Et Ta Da” or “Ay Teh Dah” or in English, “Safe” which meant “Everything’s good – how are you?” It has since moved into Rock and Goth subculture to mean We’re Cool or Rock on. 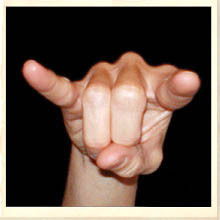 Uocchio e maluocchio: This is a variation of the “horns” hand gesture that is reasonably common in Italy – and Naples in particular. 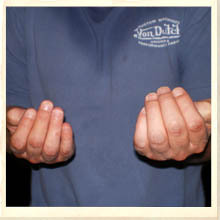 The hand is held up and the fingers are extended as shown. The wrist is swivelled back and forth. In Naples it it is usually used by women to a insult a man and implies that he has been “cuckolded” or in simpler terms – his wife (girlfriend) is having an affair. Shown by one man to another it is considered very serious “Fighting Talk” and is one of the worst hand gestures that can be made. Its inappropriate use will usually result in physical violence. DO YOU GET IT / UNDERSTAND? 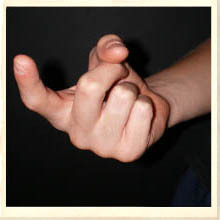 The fingers of the dominant hand are closed as if “pinching” an idea. It is usually used by a dominant to a subordinate to enforce a verbal point that has just been made. 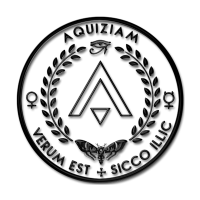 In essence, it is a physical representation of the statement/; “So you get the idea?” In Italy, the land of the Hand Gesture, it can also mean “what are you saying? Depending on how obvious and aggressive the signal, it can vary in intensity from “Casual” to “mildly rude”. The more it is waved and thrust at the recipient, the more it can be perceived as derogatory. 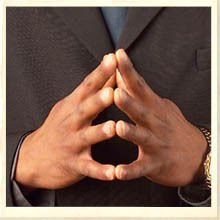 The Steeple Hand GestureBelieved to be a sure sign of confidence this is most commonly used by a seated person and imparts a clear message of authority and serene control. In many cases this is a superior to subordinate hand gesture. It can also imply that the user is listening patiently and wisely while at the same time thinking deep and important thoughts. As such, it’s similar to meditation postures. Still, if used too blatantly, it can be misinterpreted as supercilious or “master mind at work.” It has been used often in B-grade “Hong Kong” movies usually performed by the master villain. Come Here Hand GestureIn today’s (Western) society, the “crooked finger” is seen as a somewhat impolite hand gesture. The hand is extended and the forefinger is then repeatedly curled towards the palm in a hooking motion. Almost exclusively a superior-to-subordinate (parent-to-child) hand gesture, it has arrogance about it. You may have used it on people more junior to yourself but just try it on your superior and then watch their shocked facial expression. It is used for summoning a waiter and, in some countries; it is used exclusively for calling-over a prostitute (Philippines). Today this powerful gesture simply means defiance against authority, solidarity and, in certain contexts, anarchy. Once very common amongst communists, protest gatherings and anti-racism movements, this was the gesture Nelson Mandela chose to make when he was released from Robin Island after three decades of captivity. It is sometimes known as the “Red Salute” and “Black Power” gesture made recognisable by the Black Panther political group. 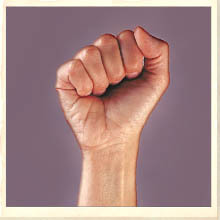 According to some sources, anarchists and protesters raise the right fist and communists the left. The empty hands, shaped as they are above, suggest that the applicant doesn’t even have a bowl. It signals a degree of desperation on the part of the user. In language it states “I have nothing left to offer but my humility and a plea for your charity.” when used by genuine beggars there is no misunderstanding its context. However, when subconsciously used in circumstance where the user is clearly not living-hand-to-mouth it is plea for agreement and support while acknowledging that they are wholly dependant on the whim of the person for which the gesture is intended. However, some rude hand gestures are so universally established that their use in just about any country can get a person into serious trouble. The “Middle Finger” sign is just one example. In Dubai (United Arab Emirates) the use of obscene hand gestures by motorists is an offence that is likely to land a person in jail. The problem is that there are so many different cultures intermingled in the city that no one is really sure what is rude and what isn’t. As a consequence, drivers hardly ever gesture to each other – even to say thank you – just in case that casual wave is misinterpreted. An interesting observation by scientists is that chimpanzees learn hand gestures quite quickly and even seem to use them in the wild without training. These gestures actually seem to apply cognitive meaning to their use. This is seen as significant evidence that hand gestures, as a form of communication, may significantly predate the spoken word.